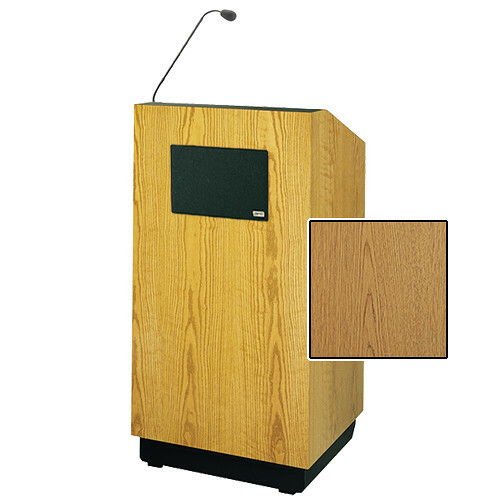 The Da-Lite Lexington 48" Multi-Media Lectern with Gooseneck Microphone is a wooden unit with light oak laminate, and a computer-based presentation area that can also accommodate an array of media equipment. The reading surface has a cutout for a 17" monitor. The front has a pull out keyboard shelf with fold-down door, and there is also a pull-out shelf for a mouse. A right side pull-out shelf is there for a small projector. The illuminated reading surface features a high-intensity lamp and is large enough to support a 3-ring binder. A 120VAC, 60Hz AmpliVox 70 watt amp sound system is provided that features multiple inputs and outputs including two aux outputs for optional satellite speakers. The built-in 70 watt speaker includes a 6.5" woofer and high-output tweeter. The system features a dynamic gooseneck microphone with mount. On the base of the lectern, there is a two door cabinet with four adjustable storage shelves. The dashboard features an LED digital clock/timer with countdown function, and two power outlets. The interior of the lectern features a six-outlet power strip. Two non-locking casters allow you to move the lectern to a desired position. The Lexington operates on 120VAC / 60Hz and includes a 12' power cord suitable for a North American outlet. Box Dimensions (LxWxH) 63.0 x 54.0 x 38.0"